The mysterious real interest rate – the one typically denoted as r in economic theory – does not have a real-life counterpart. This is a problem for economic theory. And it is a major problem for policymakers relying on monetary policy to boost economic activity. While we think of the nominal interest rate minus inflation as getting close to the theoretical concept of real interest rates, changing this value in practice through central bank operations does not actually change the real return on capital and stimulate investment through that channel. Because the price of capital is determined by the interest rate! We have known this for a long time. Joan Robinson wrote about the circularity of reasoning when we measure the quantity of capital by its price. She was ignored. As I expect to be. For those who want to understand a little deeper, here are some more details. First, we take the standard economic view. In this view there is a thing called capital, K, that has a fixed cost (because it is a machine or building etc. ), and each unit of K has an income-earning potential, net of depreciation, each period, which I call I. To buy each K people borrow money at the rate, r, meaning that as long as the ratio I/K > r it is profitable to invest in more capital, K.
So if my business can generate $100,000 in extra profit each from an extra machine, the business might see the value in spending $1,000,000 on that machine if they can borrow to pay for it at a 9% interest rate (costing $90,000 per year in interest), rather than an 11% interest rate (an annual interest cost of $110,000). However here’s the circularity problem. The gains from a lower cost of new investment are made whether the investment is undertaken or not because they become capitalised in the value of the business immediately. That is because the value of the option to expand is always captured in the market value of the assets of the business. What is this option I speak of? Where did it come from all of a sudden? The way I snuck this into my definition of capital is part of the fundamental problem that permeates all the economic debates about capital. One group talks about capital as machines — independent robots, vehicles, machines and tools, who get to keep the returns from their existence. Yes, my bulldozer gets income from its efforts in this view, not the owner of the bulldozer. Because once you have an ownership structure overlaid, you have a system of property rights which contain real options for investment, and they have a value. Think about land. Land is often referred to as capital, but it is nothing but a piece of paper offering a particular set of rights to a three-dimensional chunk of the universe. Land is an ownership right, not a physical object. See my mud map of economic concepts to help see what I mean here. Once we have shifted to a view of capital of a system of property rights, some of which have physical machines attached to them — like a building attached to land rights, or a truck attached to various rights held by a trucking company — we can begin to see the circularity problem more clearly. We now have a world were investors maximise the return on their property rights, not one where machines decide how to maximise the return on themselves. This means that anyone making a decision to invest in new machines must take into account the current value of their property rights as part of the cost of capital. Because the full opportunity cost of the investment in a machine is the next best alternative, which is to sell the property rights at market value. 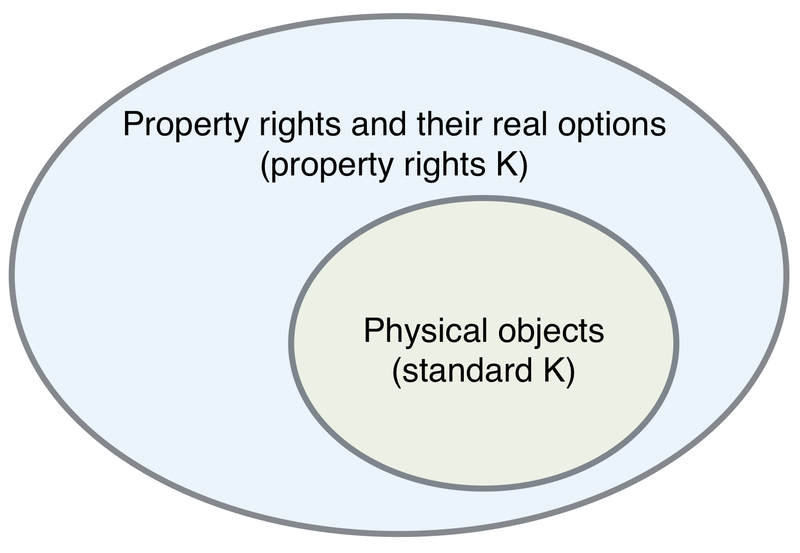 In the diagram below I try to capture the idea that all physical capital — buildings, machines and so forth — are attached to property rights, and that only if we look at the value of the whole can we get the true cost of new capital investment from the perspective of owners of property rights. Let us now see the effect of decreasing interest rates in a world of property rights, and where the value of these rights is part of the cost of capital. We will take the simplest case of a piece of vacant land, where the full value of the property right is from the option to build a $1 million building on that land to earn a future income of $100,000 per year. Here only the building is part of physical capital in standard economic theory. We will then see what effect a reduction in interest rates has on the cost of “property plus capital”, and therefore the incentive to invest for owners of property rights. The table below summarises. Let me walk you through this. The interest rate is the real interest rate. Take it as the nominal interest rate in a zero inflation environment for simplicity. The income from investment is the annual income after the building is built. The value of that income is capitalised at the new interest rate to show the static value. Then we see that when the interest rate is reduced, the $1 million building gets a positive rate of return, and hence the change to the interest rate will provide the incentive to invest. As a side note, the alternative way to see this is to simply assume that the cost of the building is borrowed at the interest rate, as I did earlier when discussing the standard view. In this case, the cost of capital is $110,000 per year before the interest rate fall, and $90,000 per year after the interest rate drop, shifting the investment from an unviable to viable way earn the $100,000 per year. 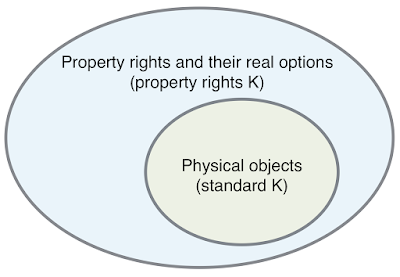 But, if we consider the value of the property right as well, we have a different picture. Here, the value of the property right is the residual after taking the investment return (capitalised value of income) and subtracting the physical investment cost (cost of investment). With interest rates of 9% in the 'Before' case, the value is negative, and there is clearly no return on capital (i.e. for property valuers out there, this building is not the highest and best use of the land). But even after the interest rate is dropped to 9%, the return on the combined “property plus capital” is zero, because the cost of capital now includes the opportunity cost of selling the property right at a positive price. Even if we decrease interest rates further, say to 7%, the rate of return on “property plus capital” is still zero, as I show in the last column. Owners of property rights simply gain at the expense of those in society who do not own substantial property rights and will be future buyers of those rights. Under this view, the investment effect of lower interest rates disappears. The reason is that the capital of economic theory, and hence the real interest rate of economic theory, cannot be detached from the reality of a system of property ownership rights. I’m not the only one to say this either. Once you are in a world of property rights and real options, the key determinant of investment is not the real interest rate of standard theory. Here’s Raj Chetty showing that increasing interest rates from low levels can bring forward investment — the exact opposite of the standard view. In a world of property rights an real options, the key factor is not what to invest, but when to invest in order to maximise the rate of growth in the value of your property rights. Hence there is a huge role for speculation on the price of property rights, and a clear logic behind following the herd during asset cycles. Under these conditions, it is also the case the reducing interest rates reduces the cost of delaying investment, and may, in fact, slow rates of investment and economic activity! Let me summarise. First, standard theory has machines earning incomes and ignores the system of property rights it attempts to model. Second, once you incorporate a system of property rights these right have values, and the value of these rights must be added to the cost of machines to calculate the economic (opportunity cost) of capital. Third, once you have done this, changing the nominal interest rate (or even nominal rate minus inflation) changes no investment incentives, as all property rights holders immediate gain the value, which becomes a cost of investment. Finally, other factors that affect the cost of delaying investment by owners of property rights probably have a larger effect on investment, and in fact, decreasing interest rates decreases the cost of delaying investment. This is not to say that there may be some effect of monetary policy through other channels, such as decreasing interest costs of borrowers, allowing them to increase spending. But if this is the dominant effect, without an investment incentive, then loose monetary policy may primarily inflate asset prices and not economic activity. This prediction gels with the reality of the past decade. For a moment I didn't think I had time to read this. Fortunately I changed my mind! Epic Research provides comprehensive Forex Tips for those traders who want to invest in this segment and earn a big profit. So timing is everything and no free lunch, except perhaps for the banks who can capitalise on credit expansion. That's the way I see it at the moment. Perhaps this implies that a fiscal strategy of spending so as to "feed" the capital assets with revenue would more effectively boost ROI expectations among investors in both real and intangible capital. Then private investment may lift off. Of course, the "feeding" would be putting money in the hands of the customers to spend. Yep - at least that is my view. one small question here, aren't you implicitly assuming that the property is a liquid asset here? As far as I see, the change in interest rate would have a different impact on different assets, based upon their liquidity. It is something we need to measure before we come to the conclusion you have come to. Short answer, yes. But in one blog post, I think getting the basic message across is enough! But even quite small businesses still have a value of their business in term of the bundle or property rights they have put together - location rents, rights to staff time and their expertise, goodwill etc. The business has a value still, and can be sold, though perhaps the market is not that liquid. Then again, does it really matter? The value goes on my balance sheet whether the market is liquid or not. Lot's to discuss regarding this point. I actually want to get in touch with you to discuss about drivers of long term investment in infrastructure, and the role of pension funds can play in such investments. I would be grateful to you if I could have your contact. I am an economics graduate from Humboldt University, Berlin. I would be grateful if you could recommend me some literature on interest rate sensitivity and long term investments. In terms of the literature that is consistent with what I wrote, anything on real options and investment timing will do the trick. My best email is rumplestatskin at gmail. Happy to discuss.